Champions League Winners - What's your story? Where were you?. Rather than write a detailed match report, I wanted to do this instead. It was quite simply the best footballing 12 hours of my life on Saturday and I am still buzzing over the fact that we are Champions League winners!. What I will say about the game is that Chelsea's determination and resolve shone through yet again. Yes we were battered by Bayern Munich as we had been against Barcelona, but people need to realise what was at stake in these games. Robbie Di Matteo had set his team up to be solid defensively and rely on a goal from a counter attack or a set piece and there is nothing wrong with that. I have already had a comment from a Spurs fan saying that Chelsea won but never played football, I responded by saying that in a few years from now, no one will remember how the game was and all that matters is what goes into the record books. What a performance from Mikel. What a fantastic decision to give Ryan Bertrand his debut. What character from the team to never give in after going a goal down with just seven minutes to go and what a header from Didier Drogba!. Also a special mention to Gary Cahill and David Luiz for working so hard to play!. I wrote on the day of the game a post about Drogba and asked for him to pull something out of the bag just one more time for Chelsea and he did it. One corner and one goal, that's all it takes sometimes. Petr Cech! What can I say? Outstanding saving Robben's pen and the two in the shootout. A special mention to Frank Lampard, David Luiz and Ashley Cole for burying fantastic penalties under immense pressure and to set it up for Drogba again. I guess it was written in the stars!. As soon as we walked up I knew he would score and when he did it was just incredible. I was in Fulham Broadway from midday on Saturday and took up a place in Brogans early doors to grab a bite to eat, to get a good spot before the Championship Playoff Final before it got busy. By 3pm it was busy in there and by 6pm it was packed solid. The whole build up was amazing as the Chelsea fans got into full voice. "One man went to mow", "5 German Bombers in the air", "Double, Double, Double, John Terry has won the double", "We hate Tottenham" and more were being belted out by literally all of us. We all went through every single emotion as the game played out. I remember when Bayern scored I thought "No! We can't lose another one" and thankfully the main man stepped up and scored a fantastic header. 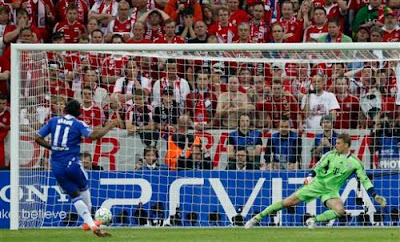 I said before that I have never celebrated a goal like Fernando Torres' goal in the Nou Camp but THAT header from Drogba went one better at the time. The roof came off the place!. Into extra time and Robben was about to step up for the penalty and I remember saying to myself out loud "Come on Cech save it!" and he did. Once again the pub erupted and I turned to my mate and said "How much luck have we had in this competition!. Our names on this trophy!". Little did I know!. Into the penalty shoot out and I had been saying all day "Forget it if it goes to penalties and you will never beat the Germans!" so you can imagine how most of us felt and our worst fears came to mind as Mata's penalty was saved!. "We can't lose this again on penalties!" I cried out. I am ashamed to say it, I had to look away as David Luiz stepped up. I couldn't watch it and my heart was in my mouth!. The roar went up as he scored and I turned back round again. 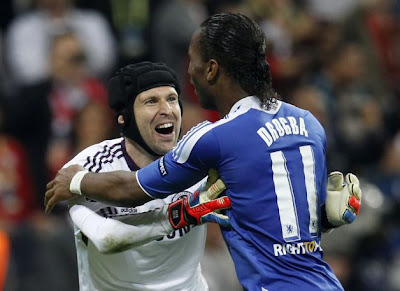 We all knew we needed Cech to make a save and when he did, yet another roar went up almost as big as the Drogba goal. Now it was Cole stepping up and we knew if he scored it would be all square. With my hands over my face I couldn't bear it but he scored!. Then it was Schweinsteiger who we had all seen celebrating at The Bernabau after scoring the winning penalty. Cries of "Save it!" came out from everywhere. As he stepped up and checked himself and then was about to strike it I thought he's gonna miss this and when he did it was amazing!. For about 30 seconds we were all celebrating and then all of a sudden we went quiet. That was until Drogba walked up to take the penalty. Another roar went up when we realised he was the last one and all he had to do was score. Expectation and anticipation spread through the bar and then as the Referee blew the whistle the pub fell silent. Didier scored and pure emotion broke out everywhere. I have never cheered so much in all my life. I think I even screamed and look upwards with arms in the air saying we've done it!. I was hugging and jumping about with people I don't even know because we all know we have finally done it!. So I want to say thank you Chelsea for being you. For never giving up, for pulling together and for giving me one of the best nights of my life. Whatever happens from now, you are history makers and we will love you all forever!. That's my story of the day as I was one of the unlucky ones that couldn't get to Munich. So what's your story? How was your day and where did you watch the game? I would love to hear from as many Chelsea fans as possible on this because it's important that we share our experiences. So come on, post up your story including where you are from so we can hopefully get views from all over the world! Don't be shy people! We are Champions of Europe!! What was your story of the day and where were you when we won it!? Check out my blog posts on the Official Chelsea Website. Follow me and my blog on Twitter. Follow the blog on Facebook. Sign up to my email updates.